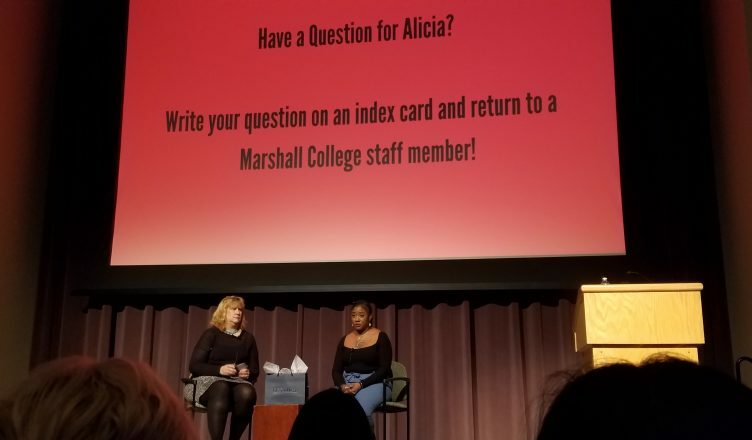 Black Lives Matter co-founder and Thurgood Marshall College alumna Alicia Garza gave a talk to a crowd of nearly 200 students, staff, and faculty in the Price Center Ballroom on Feb. 26 as part of both the Marshall College Speakers Series and the celebration of Black History Month., As the second speaker in this years’ series, the activist demystified the Black Lives Matter movement and called for intersectionality and solidarity to address current and recurring social issues. Recognizing that the evening was also the seven-year anniversary of the murder of Trayvon Martin by George Zimmerman, Garza began the discussion by asking the crowd for a moment of silence in honor of the Martin family. She then went on to list other black people who have been arguably murdered under objectionable circumstances, specifically Sandra Bland, Renisha McBride, Jordan Davis, and Michael Brown. Speaking on the topic of the Black Lives Matter movement, Garza also carried out what she called a “myth-busting” of the movement. She stressed that the movement was not anti-cop or anti-white and was not a terrorist organization. In addressing “Blue Lives Matter” as a term that, alongside “All Lives Matter,” has become a reactionary one to “Black Lives Matter,” Garza was notably empathetic to police officers. In turning toward politics, Garza claimed that voters have “one shot” in November 2020 to obtain the future they want. She voiced her support for the Green New Deal, condemned voter suppression, and called for more involvement in the voting process. Specifically, she called for students to register to vote here in San Diego as opposed to in their hometowns. Garza emphasized that the movement to combat systemic problems that have drastically negative impacts on people of color is not an exclusively black movement, but a humanistic one. Garza also answered questions on how non-black allies can support black liberation without appropriating black culture, how to execute activism on a college campus, and how UC San Diego can support the movement. Why do you waste good journalism on a subculture of blacks who act like animals?? ?